The Focke-Wulf Fw Triebflugel (Triebfluegel if the x�-umlaut is not used), or Triebflugeljx�ger, literally meaning "powering wing" or "powered-by-wings fighter", was a German concept for an aircraft designed in 1944, during the final phase of World War II as a defence against the ever-increasing Allied bombing raids on central Germany. It was a Vertical Take-Off and Landing tailsitter interceptor design for use local defense of important factories or areas which had no or only small airstrips. The Triebflugel had only reached wind-tunnel testing when the Allied forces reached the production facilities. No complete prototype was ever built. The design was particularly unusual. It had no wings, and all lift and thrust were provided by a rotor/propeller assembly in the middle of the craft (roughly halfway between cockpit and tailplane). When the plane was sitting on its tail in the vertical position, the rotors would have functioned similarly to a helicopter. When flying horizontally, they would function more like a giant propeller. The three rotor blades were mounted on a ring assembly supported by bearings, allowing free rotation around the fuselage. At the end of each was a ramjet. To start the wings spinning, simple rockets would have been used. As the speed increased, the flow of air would be sufficient for the ramjets to work and the rockets would expire. The pitch of the blades could be varied with the effect of changing the speed and the lift produced. There was no reaction torque because the rotors were free-spinning. Fuel for the ramjets was carried in fuselage tanks, and was piped through the centre support ring and along the rotors to the jets. A cruciform empennage at the rear of the fuselage comprised four tailplanes, fitted with moving ailerons that would have also functioned as combined rudders and elevators. The tailplane would have provided a means for the pilot to keep the fuselage from spinning in case of a slight friction against the rotor ring as well as controlling flight in pitch, roll and yaw. A single large and sprung wheel in the extreme end of the fuselage provided the main undercarriage. 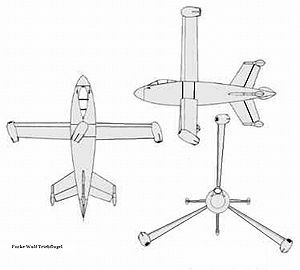 Four small castoring wheels on extensible struts were placed at the end of each tailplane to steady the aircraft on the ground and allow it to be moved. The main and outrigger wheels were covered by streamlined clamshell doors when in flight. When taking off the rotors would be angled to give lift as with a helicopter or, more accurately, a gyrodyne. Once the aircraft had attained sufficient altitude it could be angled into level flight. This required a slight nose-up pitch to give a downward thrust as well as primarily forward thrust - the rotors would have provided the only significant lift. Consequently, the four cannons in the forward fuselage would have been angled slightly downward in relation to the horizontal centre line of the fuselage. To land, the craft had to slow its speed and pitch the fuselage until the craft was vertical. Power could then be reduced and it would descend until the landing gear rested on the ground. This would have been a tricky and probably dangerous manoeuvre given that the pilot would be seated facing upward and the ground would be behind his head at this stage. Unlike some other tailsitter aircraft, the pilot's seat was fixed in the direction for forward flight. The spinning rotor would also obscure rear vision. This design was unique among 20th-century VTOL craft, and other German concept craft. However, some early design studies for the Rotary Rocket Roton spacecraft in the 1990s showed a free-spinning rotor with tip-driven rotors providing lift. The lift concept was later abandoned and rotors would only have been used to provide autorotation drag for re-entry and landing. In the 1950s, the USA built prototype tail-sitter aircraft (the Lockheed XFV, and Convair XFY Pogo) but these were powered by conventional turboprops, with nose-mounted contra-rotating propellers to counter torque. They also used conventional wings for lift, though their cruciform tails with integral landing gear were broadly comparable to the Triebflugel.